It’s not often that the fates conspire to have me taste the latest release of Unico twice in as many months and I would be foolish to pass up the opportunity to share my thoughts on what is (I think we can all agree?) Spain’s greatest wine. Of course, there are pretenders but Vega-Sicilia has the pedigree. And lots of people put lots of store by pedigree. Pedigree is the main argument for not tasting wines blind. For instance, if you taste Unico next to a whole lineup of similarly highly-rated wines (see my previous post on the Penin tasting), I’ll forgive you for thinking Unico is slim, ready-to-drink (almost as if it was on the downward slope of maturity), unimpressive and unexciting. Indeed, these were my immediate reactions to it. But, knowing that it is Vega-Sicilia, this has to be offset by the irrefutable fact that Unico can age, and age very well. Luckily, I tasted it again last week, and more importantly I tasted it without a lot of big-hitting, high-fruit, high-alcohol, high-tannin wines clamoring around it for attention. It became immediately clear that Unico 2000 is a wine of great finesse. By ‘finesse’ I mean that it has everything you want in a so-called blockbuster wine but it’s all toned-down and harmonious. In a strange way, it might seem a little weak but like a good Burgundy, it can stand up to hefty food surprisingly well. Although I think there is an element of over-sweetness on the nose (in the sense that a rose just after full bloom smells almost sickly), it is undoubtedly a very good wine. But anyone familiar with my blogs and my outlook knows that I disapprove of high-priced wines. 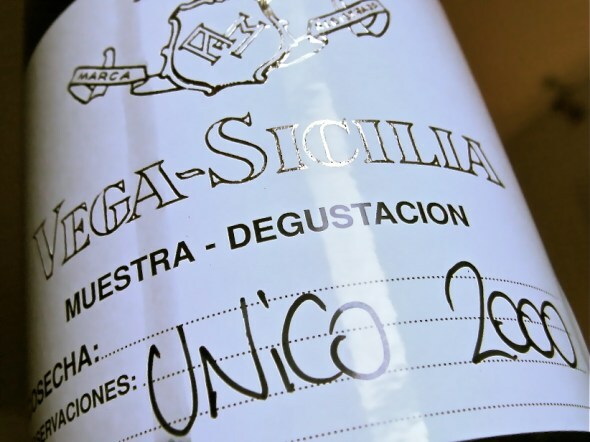 You may disagree with me, you may not, but it would be wrong – and insulting to my readers – not to mention the price of a bottle of Vega-Sicilia Unico: €150-200 is the minimum you will pay. To me, no wine in the world is worth that much. Therefore while I can happily praise Unico for being a great bottle of wine, I do not praise its price and I wish such wines were more accessible to more people – for the good of the wine world as a whole, not simply as a money machine for a few, select families. Spicy, dark berry fruit, inky, almost sickly-sweet. On the palate this is lovely, soft, spicy, warming, slender but with muscle and controlled power. There is great structure and length to this wine. Fantastic. But remember, it’s just a wine.